There are no guarantees of getting a second chance in the NFL, but when they occur teams need to be ready to capitalize on them. That’s the situation the Cleveland Browns now find themselves in after their complete beat down of the Cincinnati Bengals on Thursday night. The primetime win announced to the nation that the Browns are for real this year and tops the team’s previous big win of the season against Pittsburgh. The win against the Steelers on Oct. 12 had the team and its fans believing a better day was finally here, but the Browns followed up that big day by falling flat the following week against Jacksonville. Now the Browns have earned themselves a second chance after winning for the fifth time in the past six games. Cleveland turned it what was probably its best overall game in posting its most one-sided win against Cincinnati since 1987, holding the Bengals to just three points and 165 yards of total offense. “We put a lot of time in (preparing for the game),” linebacker Karlos Dansby said. “The schedule was hectic. Coach put a lot of pressure on us to handle it, to be professionals, and we handled it. We were dialed in. We knew exactly what they wanted to do, how they wanted to do it, when they wanted to do it. We’re calling out screens. We’re calling out run plays. We’re calling out everything right there on the field. Cincinnati recorded an offensive efficiency of -26.8 – the worst offensive efficiency for any NFL team this season, and the Bengals’ worse since Week 17 of the 2009 season. The Browns scored three rushing touchdowns, meaning the Bengals have now allowed a league-high 11 touchdowns on the ground this season. The Browns dominated the Bengals on the interior, totaling 132 rushing yards and three touchdowns between the tackles, both season highs. 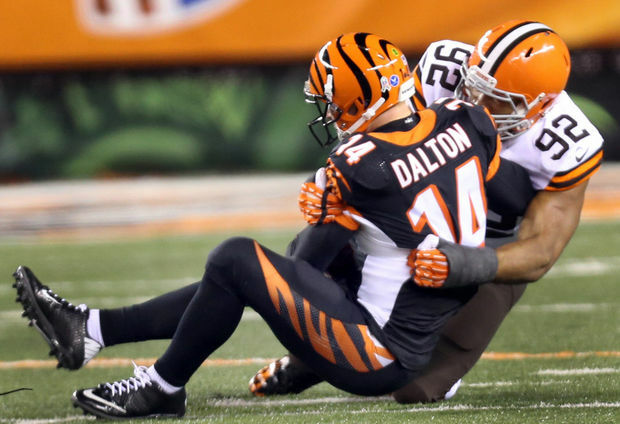 Then there is Cincinnati quarterback Andy Dalton, who was 10-of-33 for 86 yards and three interceptions, and who deserves his own section after what the Browns did to him. Dalton ended the night with a passer rating of 2.0 – the fourth-worst in the NFL since 1960 among quarterback who attempted at least 30 passes in a game. As Bill Barnwell points out at Grantland, Dalton joins Norm Snead, who posted a 0.5 rating during a game as a rookie with Washington in 1961; Scott Brunner, who posted a 0.3 rating for the Giants against the Cardinals in 1983; and Buffalo quarterback Gary Marangi, who posted a 0.0 in a game in 1976. How weird is it to see horrific quarterback play and not have it come from someone wearing Orange and Brown? The beating was so bad it left the Bengals befuddled, none more than rookie running back Jeremy Hill, who managed just 55 yards on the ground after running for 154 yards last week against Jacksonville. 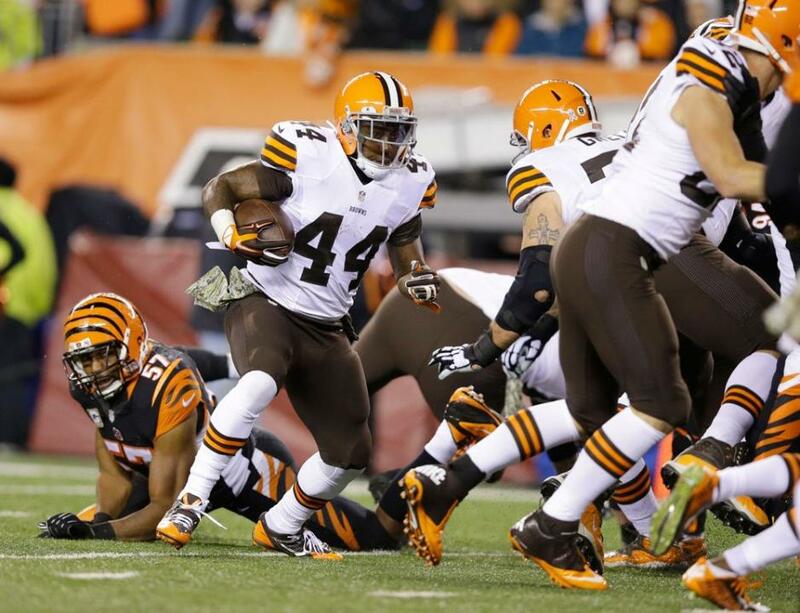 On the Browns side, it was nice to see them continue to have a commitment to the running game – especially given the windy and rainy conditions that hit Paul Brown Stadium during the game. While the Browns only averaged 3.3 yards per carry, the stuck to it and rushed the ball 52 times and did get those three rushing touchdowns, one from each of their three backs. The fact that the Browns continued to run the ball left the Bengals having to worry about the run, opening things up for Brian Hoyer to do Brian Hoyer things and he responded by finishing an efficient 15-of-23 for 198 yards, no turnovers and no sack. “The numbers don’t lie. (Brian’s) having a heck of a year for us, and the important number is the six wins,” head coach Mike Pettine said this afternoon.”I think last night is also a function of how the guys played around him. We were very quick to criticize Brian in some of the recent games – Jacksonville in particular – when we all know the 10 guys around him, his supporting cast, didn’t play all that well. I thought last night that the offensive line played well. We ran the ball, which got us back to our formula. We could protect him. I don’t think we gave up a sack. I don’t even know how many times he was hit or really hurried. The receivers ran good routes, caught the ball. Hoyer’s record alone should stop any and all calls for Johnny Manziel to take the field this season for the Browns. 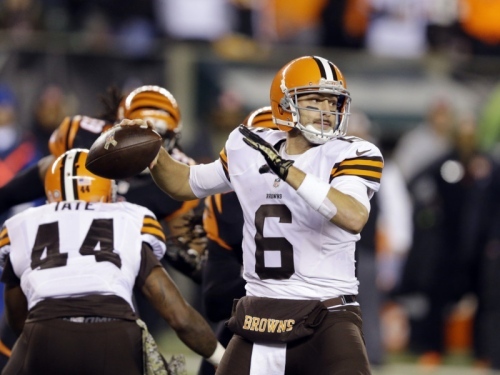 Simply put, what more could Manziel do that Hoyer isn’t already doing? And what team pulls its starting quarterback when they are 6-3 and on the brink of taking over the lead in the league’s toughest division? As we wrote at the top, the win against the Bengals gives the Browns a second chance and a 10-6 record (maybe better?) is realistically in their sites. If the Browns can play the way they did last night against the Bengals, they can clearly beat Houston, Atlanta, Buffalo and Carolina, which would put them at 10 wins. They’ve already beaten the Bengals and lost to Baltimore on a last-second field goal. Who’s to say they can’t sweep Cincinnati and take out Baltimore in the rematch? That’s a big if, obviously, as the Browns still have areas of concern. But they are starting to get healthier; Josh Gordon will be back after one more game and, possibly, Jordan Cameron with him; and, most importantly, the team believes in itself and in the notion that anything is possible. But it all starts with the Browns – it’s up to them if they are going to continue the way they did last night or if they still have a couple of Jacksonville games in their pockets, ready to toss down at an inopportune time. 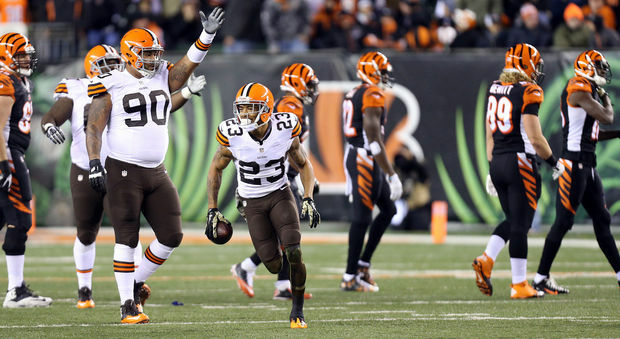 The Browns have earned themselves a second chance this season with their recent play. Let’s just hope they take advantage of it this time.